Katherine Eliot has been writing professionally since 1997. Projects have included writing promotional material for a mental health clinic outside Philadelphia. Eliot will receive her Masters of Art in Art Therapy from New York University in 2011, and holds a Bachelor of Art in Visual Art from Brown University. According to MayoClinic.com, eating a healthful breakfast is essential to maintaining a healthy weight and lifestyle. 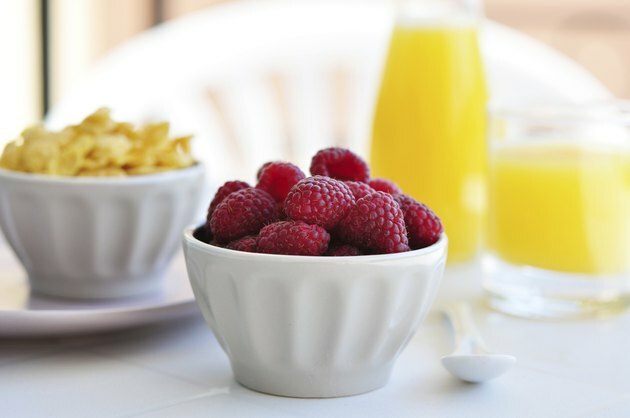 Eating breakfast provides you with more energy so you can have an active, physical morning that is snack-free. You can design a healthy breakfast based on a simple core formula of whole grains, low-fat protein, low-fat dairy, fruits and vegetables. Get creative and experiment with different food combinations to create a range of sweet and savory healthful breakfasts. Buy cold cereal that is high in fiber and low in sugar. In order to get your morning serving of protein, select a cereal that has nuts or includes a high-protein grain, such as quinoi. Top your cereal with fruit to add sweetness to your breakfast. Try sprinkling blueberries or sliced strawberries on top of bran flakes. Use low-fat milk or your favorite non-dairy milk--such as soy or rice milk--to top your cereal. In the winter, a hot cereal can be the perfect way to warm up your morning. Try making creamy oatmeal topped with sliced almonds and dried cranberries. If you need a break from oatmeal, try cooking up farina, which is a milled cereal grain. Mix in sliced bananas and toasted walnuts. Eggs are an excellent source of protein; however, because they are also high in cholesterol, eat eggs for breakfast only two to three times per week. Use low-fat oil, such as canola or vegetable oil, to cook your eggs. If you prefer vegetables to fruit in the morning, try scrambling up two eggs with spinach, mushrooms, and onions. Serve with a side of toast spread with cream cheese. Another healthy option is to serve poached eggs on a whole wheat English muffin. Have a small bowl of berries with yogurt on the side. Smoothies are a delicious breakfast alternative. The basic ingredients for a smoothie include low-fat yogurt, fruit, and milk. Experiment with different yogurt and fruit flavor combinations. Try making a banana and strawberry smoothie with raspberry yogurt. Choose fruits based on what is currently in-season, or use frozen berries. Add a teaspoon of wheat germ to your smoothie, or have a slice of whole wheat toast on the side. Aside from eggs, there are many other savory, healthy breakfast options. Try a multigrain bagel with low-fat cream cheese and sliced tomato. If you are adventurous, make miso soup with tofu, bok choy, cabbage, and sea vegetables. You can also eat a simple, healthy breakfast of whole-grain crackers, cheese, and sliced vegetables. MayoClinic.com: Why Does Eating Breakfast Help Control Weight?